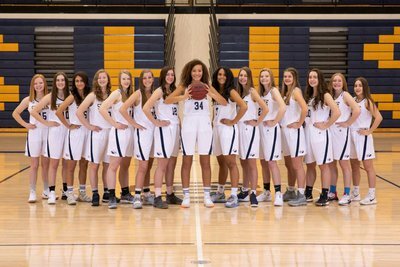 The Skyline Womens Basketball team is undoubtedly doing well this 2018 season. On December 4, Skyline played Brighton High School, and took home a victory 59 to 36. Bella Roden, number 34, commented on the win against Brighton saying, “This game I think we did really good, we were good at being patient which is normally something we need to work on”. Roden is actually a member of both the varsity and Junior Varsity teams. When speaking on the topic of where the team can best improve, Bella mentioned a lack of energy. However, she was quick to find a solution to the problem as she described how a team can lessen distractions by turning the bench more frequently, which coincidentally, would help raise the low energy levels as well. Furthermore, Bella noticed that despite the teams dwindling vitality, they still “didn’t give up, which is what…really matters”. “If you give up it’s like the game is over, so, it was a good experience”. The ability to play through fatigue and render oneself resilient in times of difficulty is, fortunately, a characteristic that Skyline’s team upholds and may factor into future improvement. Bella believes this and plans to bring that type of atmosphere to the team. When considering the build best suited for a basketball player, a taller height may easily be misconstrued as the only build that brings advantages. However, as stated by Bella, “[Taller girls can] shoot over people’s heads if [they] get stuck, but the smaller girls are good with their feet, so…it’s good to have that variety”. Skyline has that variety, which may be useful in challenging situations that come their way. In any game of basketball, a team’s unique style and skill sets can fundamentally impact the outcome of the game and for Skyline’s team, this is no exception. For example, when shooting, the team works on three-pointers, but also on layups because they can aid with the important task of getting close to the basket. Individually, different players may do what best works for them, especially when choosing whether or not play zone or man to man on the court: “I prefer man to man, because you can control players, but my team plays zone”. As far as whether or not the team does half or full court, Bella illustrated how the players half court in what they call AGGIE and set the screen in the varsity and JV games depending on how high their strength and level of play is. Setting the screen also known as picking can be described as the offense blocking a defender on the other team, therefore freeing up their teammate for a shot or pass. Bella who had two excellent games on both JV and varsity commented on the subject, saying, “I don’t do it in JV because some of the girls are weaker so I have an advantage. In varsity, I set the screen and am able to defend”. Later, when asked what the team is doing especially well this season, Bella emphasized the team’s excellent execution when setting up to defend. In addition, she said, “I think [we do well with] moving the ball. We get touches to everybody and transition well”. It’s a relief to hear such positive feedback from one of Skyline’s players, evidently the team is doing splendidly this 2018 season and improving with every game. Fans should look forward to the subsequent games to come, for there is no doubt that the team will progress later this season and have future success.